A cheery white tot experiences the first day of school. In first-person narration conveyed in rhyming couplets, the child dresses in jeans and T-shirt, eats breakfast, gets dropped off by Dad, and joins new classmates for a fun day at school. The child’s class has a diverse population, and the book’s tone is enthusiastically reassuring. The kids play outside, learn their ABCs, paint, and more. “We practice saying ‘thanks’ and ‘please,’ / and how to block germs when we sneeze.” Here, the kids all earnestly sneeze into their elbows while their teacher, a white woman, holds a box of tissues. All along the children are smiling in the ubiquitous board-book style, but as a balm for school-day jitters, the calm colors and smiling faces are effective. This title isn’t a must read, but if a little reader is nervous about going to school this title will do the trick. Judging by the size of the school and the sidewalk drop-off routine, these kids are going to kindergarten rather than preschool, which makes the audience for this board book unclear. Children of an age to require board pages aren’t ready for kindergarten, and those who are are mostly accustomed to longer books with paper pages. 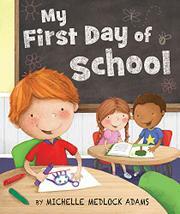 However, toddler siblings of new kindergartners will enjoy this peek at an older sibling’s day.